Yankees President Randy Levine, left, accepts the United States Sports Academy’s Male Team of the Year award from Dr. Harvey Schiller, a former Yankees CEO and 1996 Distinguished Service Award winner. 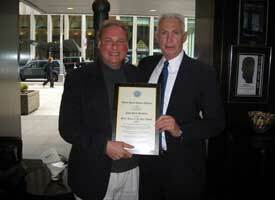 New York Yankees President Randy Levine accepted the 2009 Men’s Team of the Year Award from the United States Sports Academy. Making the presentation was Dr. Harvey Schiller, a former chief executive officer of the Yankees, and the winner of a 1996 Distinguished Service Award from the Academy.